When most people think of LEGO, they think of the brick based building system that they grew up with, but LEGO has a second building system started in 1977 that is still going just as strong. The Technic system uses beams rather than bricks to create more complex machine based builds. While Technic has a more mechanical feel to its builds, the book Incredible LEGO Technic: Cars, Trucks, Robots & More! by Pawel “Sariel” Kmiec shows some of the more creative and advanced builds that utilize the Technic system. 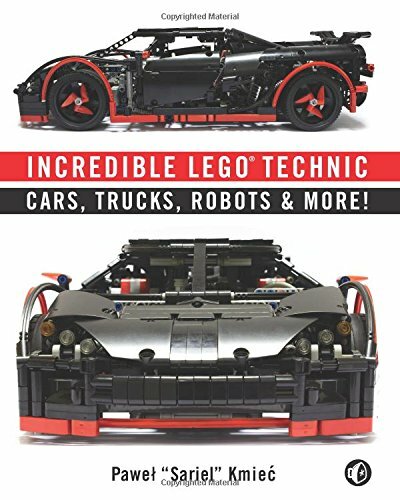 As the title Incredible LEGO Technic: Cars, Trucks, Robots & More! suggests, the book contains builds falling into those categories plus additional ones. The builds are grouped into ten chapters, each containing anywhere from two to twelve mechanical sculptures. Most of the things in the book are based on real world designs, like real sports cars and airplanes, but the use of the Technic parts tend to give them a more technical look to the designs while still maintaining the shape of the original. Incredible LEGO Technic: Cars, Trucks, Robots & More! doesn’t teach how to make any of the builds in the book, but it does give a good background on how they are built. Each finished creation is shown along with pictures of any gearing, battery powered mechanisms, and any other mechanical features in it. Each is accompanied by text which gives background on the build, challenges that occurred with the design, and sometimes more information about the original. With most of my LEGO building, I have not been much of a Technic builder, but I always find it inspiring to look at when it is done well. The pictures of the Technic builds bring out the details and design of the creations, showing what can be done with the different Technic parts and showing other builders what can be done if they put their minds to creating Technic builds such as these.